CIGS thin-film PV company soon to close a deal with a powerhouse strategic partner. Here's a quick update on the continuing M&A drama at HelioVolt. According to a report in Reuters, HelioVolt "is in exclusive talks with one potential acquirer," according to a board director. We reported on a rumor that First Solar was one of the potential acquirers. "There are a bunch of people who are interested," Scott Sandell, a general partner with VC firm and HelioVolt investor New Enterprise Associates, said in an interview with Reuters. "We're in a period of exclusivity right now with one interested party." Sandell said a deal announcement could come in a matter of weeks. According to Sandell, the Austin, Texas-based company's investors decided a few months ago that "we really needed to find a partner that could bring a lot more capital to bear." Heliovolt is "in discussion to be acquired," according to Iga Hallberg, HelioVolt's VP of Business Development. Hallberg sees it as an absolutely positive event and expects to make an announcement in "a matter of weeks." She spoke of potential "Fortune 100" suitors with the ability to bring huge reserves of capital to bear towards HelioVolt's growth. The news of the potential acquisition was initially covered by VentureWire. 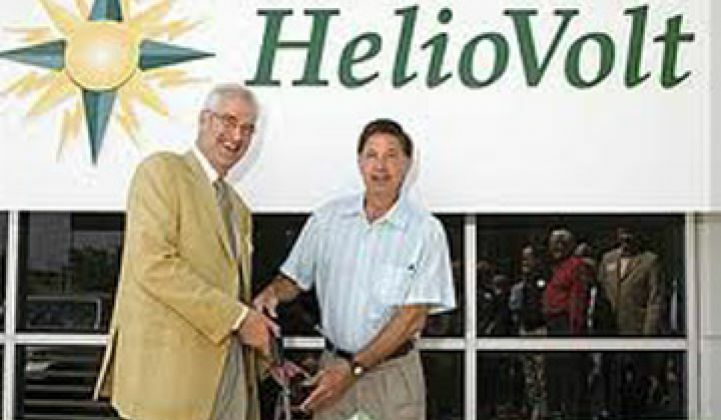 HelioVolt was founded in 2001, received its initial VC funding in 2005, and aims to fabricate CIGS solar panels using a process the firm calls "reactive transfer." Only a small percentage of startups get funded, fewer get to market and an even smaller number exit via IPO or successful acquisition. It's simply the nature of the beast. Celebrated technologist launches firm at the early part of a market hype cycle (the 2001 solar market in this case). Venture capitalists recognize a large growing market, invest big, but fail to gauge the immensity of the technological and scaling risks (thin film CIGS). Founding technologist turns out to be a brilliant visionary but less than brilliant at scaling and operating a VC-funded company and the expectations of its investors (B.J. Stanbery). Technical milestones are missed, capital is spent enthusiastically and the CEO is bumped upstairs to become chairman while a CEO with operating experience (Jim Flanary in this case) is inserted to correct the course of the firm. Ten years since their founding and about $150 million in venture funding later, HelioVolt has shipped no commercial product of consequence, Stanbery is still presenting PowerPoints heralding the terawatt energy economy and now the Austin-based startup is looking for a buyer. This is the point at which most VC-funded solar panel startups would be raising significant cash from new and existing investors to build out a factory. That doesn't seem to be happening in this case. Iga Hallberg, HelioVolt's VP of Business Development, said in an email, "We have announced great technical progress, of course. I am happy to talk about that. Regarding our search for a strategic partner, the discussions are in process. We have been fairly open about the fact that we have been engaged in discussions with a strategic partner who has the global resources and financial power to help scale our technology to GW+ capacity. When we are ready to announce the relationship, it will make sense and provide better visibility into our growth/expansion strategy." A VC colleague once told me that the ten-year lifetime of most venture funds means that an entrepreneur could have a cure for cancer but if it's going to take longer than ten years to get to market -- they're not interested. HelioVolt, like many other solar startups, is running out of time. The firm does boast a monolithically integrated module structure (as opposed to a selected cell architecture like Nanosolar), as well as some encouraging NREL efficiency test data. HelioVolt is backed by Masdar Clean Tech Fund, Morgan Stanley, New Enterprise Associates, Paladin Capital Partners Fund, Solucar Energia, Sunton United Energy, Texas Emerging Technology Fund, and Yellowstone Capital. Hopefully, HelioVolt will find their White Knight. If it's an acquisition, it might not be at the multiples these VC investors rely upon. We'll know more in a few weeks. Others: Alta Devices, Precursor Energetics, which is developing a high efficiency ink for CIGS films.